Predestination is a debated topic. Yet the Bible is clear about the doctrine of election and its importance to our perspectives on God and man, and the nature of their contributions to salvation. Because of the widespread neglect of this doctrine, many people cite Chosen By God not only as their introduction to Dr. Sproul’s teaching, but also as the resource that profoundly shifted their attention to an understanding of the predestining grace of God. Dr. Sproul shows how election is entirely compatible with human freedom, dignity, and responsibility. One of Ligonier’s most significant and popular books, Chosen by God shows why all serious Christians cannot afford to ignore this important biblical doctrine, but instead should embrace God’s initiative in Salvation. Made me understand how God shows grace to some and justice to some, and He did no wrong/sin against any of them. I was amazed at the confidence in God that this doctrine brought and the immensity of grace the Lord has given. To him be the glory. This series is a must for those who are seeking to learn more about the important foundational doctrine of predestination, as taught in the Scripture. Or if you have someone who needs to come to understand this doctrine. It was exciting to watch a friend's face light up as, while reading one of the verses in the workbook, his spiritual eyes were opened and understanding filled his mind. Praise the Lord! Absolutely the best resource to explain how God brings a human soul to Christ. After viewing this video or reading the book (which I also give out like tracts) most people remark: &quot;Wow - why hasn't my church taught me this?&quot; I have watched it probably twenty times myself and never get tired of it. I donated the book to my church library and loaned the DVD to my Sunday school class library. I thank God for R.C.! R.C. breaks the complexities of this doctrine down so even a 5-year old can understand! He zeroes in on the obvious truth of the claims and makes them virtually irrefutable. Thank you R.C. for your labor and zeal to bring our Sovereign Lord His glory! 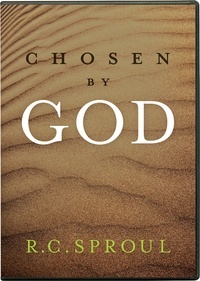 Chosen by God is absolutely the best, most concise, straightforward explanation of the concepts of &quotfree will,&quot predestination, God's sovereignty and how all these issues interrelate. I give the book away like tracts to those fellow believers who labor under the misconception that we save ourselves or that we can veto God's choice for our lives. The Lord is sovereign. None other.